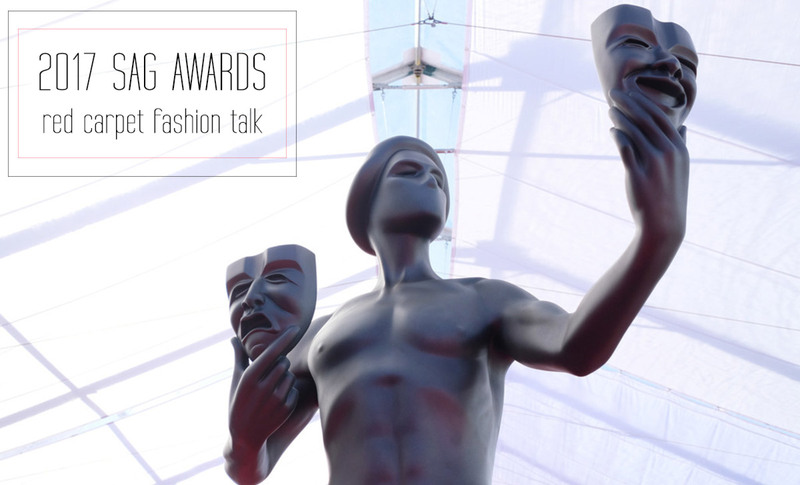 Yes, a lot has happened since, yet I have to talk about the wonderful fashion things that happened on the 2017 Screen Actors Guild Awards Red Carpet! As I was saying earlier, we live in troubled times and the very privileged position I have, as a humble observer, allows me to focus on all the changes in the world’s wardrobes. 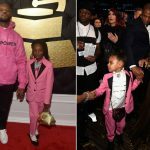 On and off the Red Carpet. Feeling doubtful about the reflection of the political life in fashion? Scroll down to see what I’m talking about! 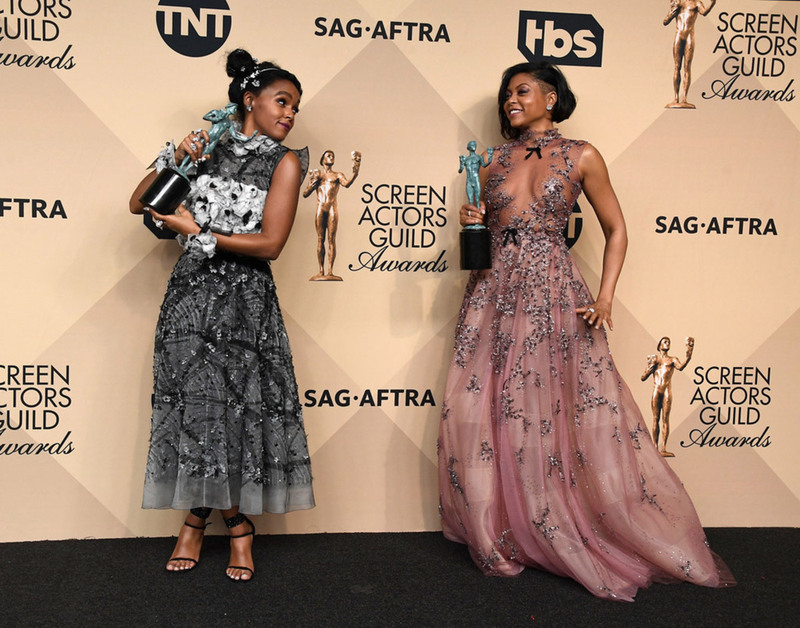 You can easily spot two main fashion directions on the 2017 SAG Red Carpet: one towards white and the other gravitating around anything and everything graphic! 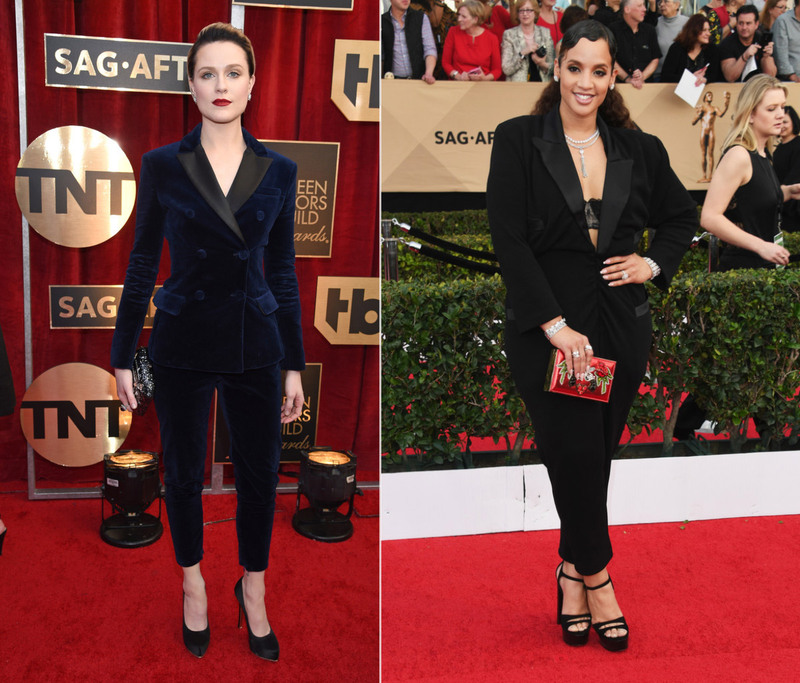 You’ve undoubtedly seen, read and heard about a gazillion of trends and style accents to considerate from this year’s SAG – didn’t you? Well, this time it’s as easy and white and … graphic! That’s it! Curious about: The Golden Globes Red Carpet? Strapless, spaghetti straps, shoulderless, tent-like, lace, embroideries, birds – you name it but keep it white! That’s the power of hope, of peace yet it can also speak volumes about the wearer! Some nuances associated with those who prefer white indicate a preference for criticism and fussiness. Fresh and humble yet precise and spiritual, cold and neat – these are values attributed to those who tend to prefer/wear white. You might not always think about it, yet these ideas go hand in hand with white and given the world’s context right now, it makes so much more sense than ever before! In the sweet tradition of graphic design and illustration, talking volumes about the hectic times we’re living in. 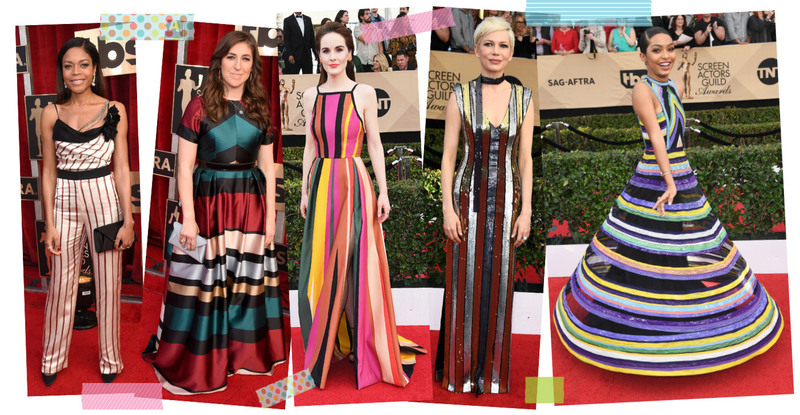 A little bit of everything all rolled into one garment – striped or flowery, the magic of graphics was all over the 2017 SAG Red Carpet! I can’t recall another Red Carpet event where stripes have taken so much fashion space – can you? Horizontal or vertical, thin or wide, stripes are clearly in! Not many are those who dare to go with another graphic story: Thandie Newton, Emma Stone and Emily Blunt are epic. As actors and as fashion story tellers. The garments they wear are enchanting and stand apart, although in line with the graphic theme. 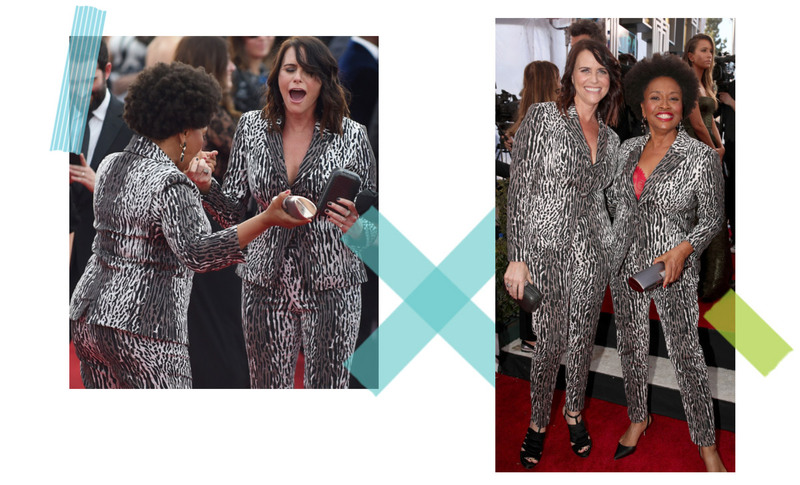 What do you think about: A very relaxed Red Carpet style at the People’s Choice Awards? Fashion you need to see: Chanel Couture collection details! Thankfully, Janelle Monae has a different stance on the Chanel issue. 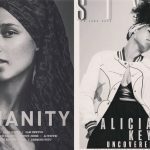 And on the trends issue… and I could go on! 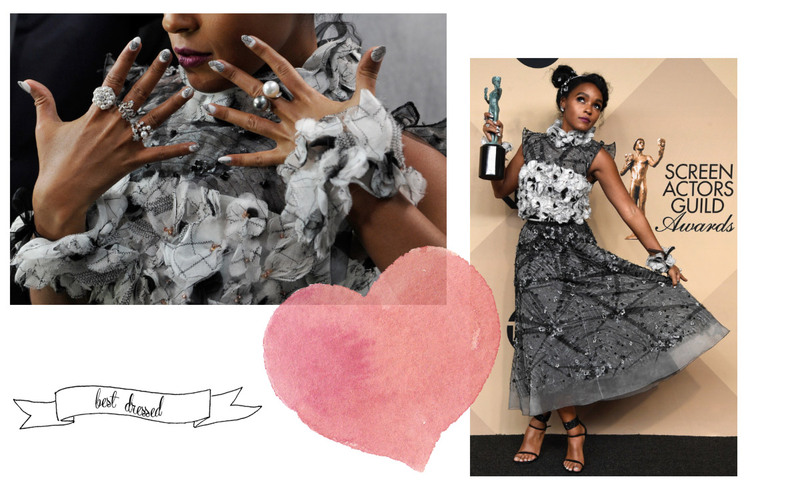 From her tips to her toes, from her hairstyle to her rings, Janelle Monae fulfilled my every fashion dream on that Red Carpet! (my heart fluttered when I saw Taraji P. Hanson too – yet although I admire her courage, I cannot applaud the sheer flowery sensation she made that night). Loving the: Illustrators Heaven Couture collections! When did every aspect of life become so political!? The vitriol of American “democracy” is hard to understand as an outsider. The whole conversation is mean spirited. I liked Taraji’s dress but I think it needed a little bit more beading in the front but she looked very pretty – and she so deserves it. The most memorable dress was Nicole Kidman’s green sequin dress with the parrots on the shoulders – not my favourite but unforgettable. 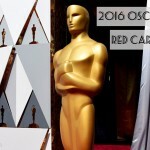 I liked Mahershala Ali style & speech – it was real & from the heart. I hope he wins the Oscar. Nicole Kidman’s green feathered thingie was… so unsubtle and so unsuitable. 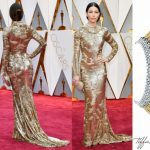 Should it have been Cate the Great wearing it, my drooling would’ve knocked down that California dam the very night! Yet I completely, wholeheartedly agree about it being memorable!